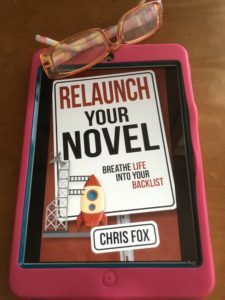 Recently I read Chris Fox’s Relaunch Your Novel, filled with tips about making money from one’s backlist. So I decided that it was the perfect time to bring out a boxed set of my first three cozy historical mystery novels plus a short story that follows the last novel. Little did I know (as cheesy fiction says) that I’d need to add a couple of things to my skill set. One of these required lots of trial and error and the time to make stupid mistakes and to fix them. 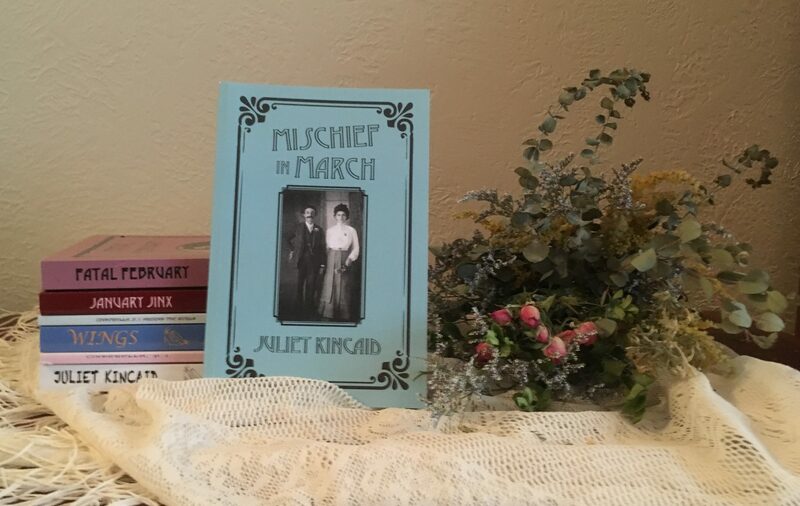 Assembling the text for The Calendar Mysteries Books 1 – 3 took little time since I just had to put together the most recent text files for January Jinx, Fatal February, and Mischief in March, plus “Detectives’ Honeymoon” with appropriate front and back matter. The latter now includes a promo for Old Time Stories, Book 4 of the series. Being finicky that way, I also ran a complete spell/grammar checker. But then as what seems to be my habit, I got in a hurry and loaded the text onto Kindle Direct Publishing before realizing that I forgot to do a Table of Contents. And when I tried to do that, I discovered that the method I used for the trade paperback versions of my publications didn’t actually provide live links in the eBook version to the items listed in the Table of Contents. So I dug out the manual to Word and found out how to do that. Learning how to create a 3D cover took lots more time. I started by looking at models on Amazon. I did some sketches of the front cover I wanted and flew them by my daughter who did the covers for the individual novels. And then I tried to find a template on KDP. No help. So I Googled the topic to find instructions. As usual, I found services that would do it for me. But it’s a matter of dollars and cents that I do everything involved in publishing myself. A video I watched went by so fast it didn’t help. Then I found a slide show that helped quite a bit – except for that author’s blithe assertion that I could do a 3D cover myself in five minutes. Oh sure. Now that I’ve figured the process out, I still think that I couldn’t do it in five minutes even doing a much simpler cover than I designed. It had ten elements: three 6” by 3” background panels, three thumbnails of the book covers, a box for the text, and three spines for the novels. But when I printed out the cover, I thought that the text for January Jinx didn’t show up well on the dark garnet colored spine, so I started the whole cover almost from scratch, brightened the bottom panel, and the spine panel. Then again I got in a hurry and put the three cover panels together in the wrong order in the background, so I had to redo that. And then when I redid the spine section for January Jinx, I made the font too small and had to redo that. With all my trials and errors, I ended up with 57 different files in that folder, including both jpeg’s and Photoshop versions. (Tip: when you get all done, make a new folder for the final text and cover files. This will save you a lot of time scanning those filled folders to see which one you need to publish.) I really have no idea how much time I spent on this. And it’s still not perfect. But I’ll no doubt be faster the next time I decide to do another boxed set (unless it’s been so long a time that I have to relearn the whole process). 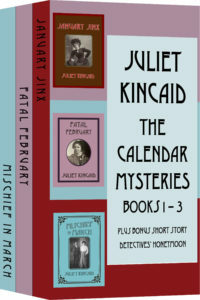 The Calendar Mysteries Books 1 – 3 is now available to pre-order for the initial price of only $3.99 at www.amazon.com/dp/B07QDKF413 That’s a great bargain for a book 972 pages and 256,836 words long. I’ve completed the almost final draft of Wings, a Cinderella, P. I. Novel and it’s in the hands of my readers. (Thanks so much, Gail, Denise, and Barbara.) And I’m working on the cover. I’m not totally happy with it, but I’ll take copies of the current versions to my art class tomorrow for help. In the meantime, I’m reflecting on some of the people from my past who have appeared with fictional disguises in the Cinderella, P. I. Fairy Tale Mysteries. First off, a riff on naming characters, often a chore for fiction writers. Some authors run contests among their fans for the right to name characters after the fans, but right now I’m mining out my memories of the past in three ways. 1) The first two characters I’ll discuss soon are named for the people who inspired them. 2) Desperate for names for a group of four men who appear in Wings, the sequel to Walls, I recalled the last names of my mother’s brothers-in-law: Walen, Young, Johnson, and Morse. Ha! Nailed that. 3) Soon after that I realized that I have a resource of character names in the teachers I’ve had over the years. Since I have a Ph. D. and went to school for twenty-three years altogether, we’re talking lots of names. So when the cook in Wings needed a name, I called her Mrs. Swetnam after my professor in Romantic Poets at the Ohio State University. 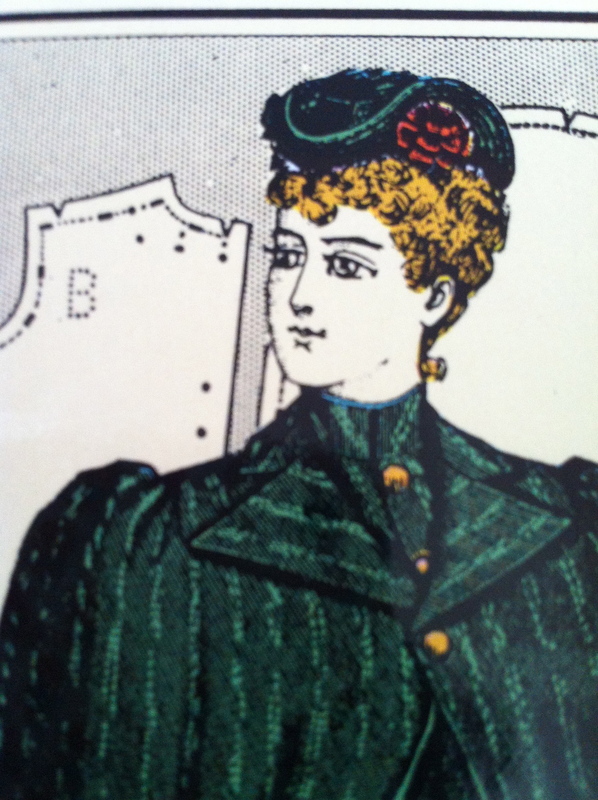 1) After I left my husband and returned to Huntington, WV, my hometown, I found a job in the Acquisitions Department in the library of Marshall University. So I needed a babysitter for my very young daughter. And my former Sunday school teacher and longtime family friend graciously agreed to care for my child while I worked. So Jessica spent weekdays for the next eight months or so in the loving care of Vi Sullenberger and her husband Delbert, a retired clock repairman, in their little house filled with clocks. When Sophie, Cinderella’s youngest child and only daughter, needed a nanny, I gave her Nana Vi. 2) In the first Cinderella, P. I. story, written in 1996, later in “Cinderella and the Missing Queen,” Prince Charming’s mother was simply the Queen, but by time I came to write Walls, I realized she needed a name. Now, the Queen in these stories loves to dance and at one point, she taught it, too. And so I named her Frances after Frances Nestor with whom I studied the ballet and other forms of dancing for eleven years. Mrs. Nestor was my first teacher who was passionate about the subject she taught. As such, she made a wonderful role model for me as a teacher. 3) And now I’ll talk about my mother, Melicent Perkins Smith, called Middie for Midget by her family members and Susie by my dad and their friends. I was my mother’s only child and my daughter her only grandchild. But she was the stepmother of my older half-brother, Homer Dale Willman, Sr. So I got to see first-hand how a stepparent operates and how a stepmother in particular can feel that her relationship with her husband is challenged by the presence of another woman’s child in the household. Although the relationship between Cinderella’s father and stepmother in Walls and Wings resembles my parents’ relationship before my dad’s retirement, I do want to make it clear that my own mother isn’t the direct model for Cinderella’s stepmother. There’s one very important difference between the two women: the fictional character lacks my mother’s inherent generosity. For instance, my mother went without new clothes for years, so that I could have the dance lessons with Frances Nestor that I so loved when I was young, the lessons that I still benefit from in terms of self-discipline, health and happiness early in the eighth decade of my life. Thank you so much, ladies. You are all fondly remembered. Walls, a Cinderella, P. I. Novel is currently available as a Kindle eBook (ISBN: 978-0-9899504-0-4) and trade paperback (ISBN: 978-0-9899504-1-1). Cinderella, P. I. and Other Fairy Tale Mystery Stories is also available as a Kindle eBook (ISBN: 978-0-9899504-2-8) and trade paperback (ISBN: 978-9899504-3-5). COMING SOON: Wings, A Cinderella, P. I Novel, second of two novels featuring Cinderella, twenty years, three kids, and a few extra pounds after the ball; and two more fairy tale mystery short story collections featuring Cinderella, P. I.: Cinderella Around the World and Cinderella and the Holy Grail. 1. For the cover of January Jinx, the first in a series of historical mysteries set in Kansas City around 1900, I needed an image to work from. And I’d already decided I wanted something distinctive. This meant clip art was out. And if I was to have half a chance of making money, I couldn’t hire anyone to do it. With some cropping, it would fit inside a frame neatly and so I would avoid the kind of linear design that had caused Cinderella on the covers of some of my fairy tale mysteries to lose her head and legs in thumbnails. Plus, I loved this young woman’s cocky pose. Still, I decided not to include the bow tie, as jaunty as it was. 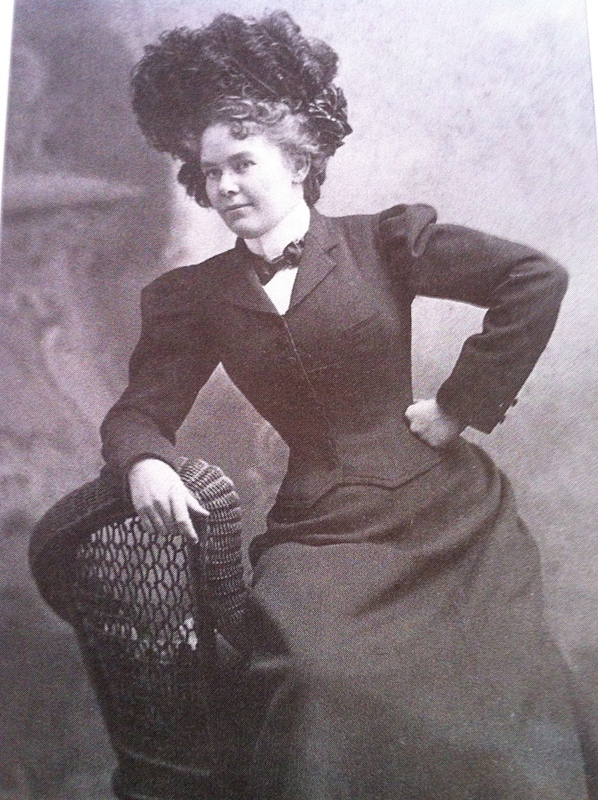 And her hat was much too big and fancy for my protagonist’s workday hat. So I used this hat as a model instead. 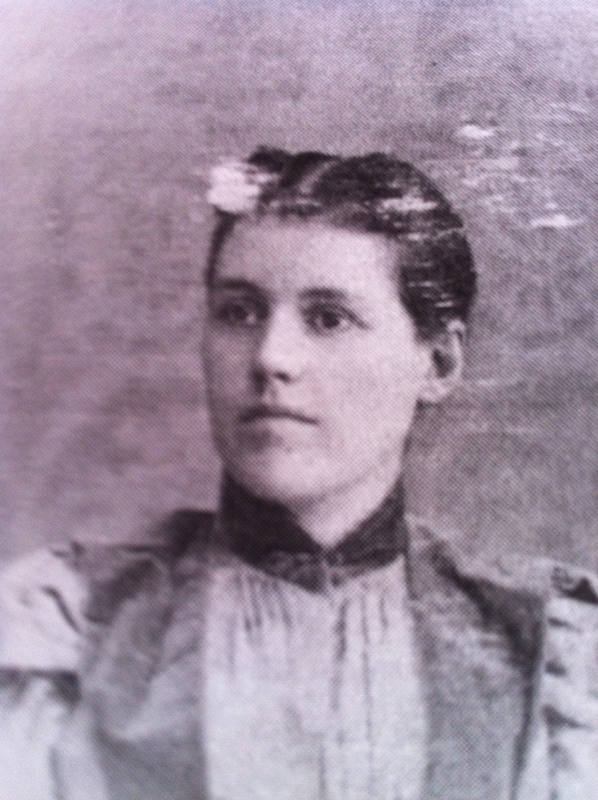 And finally, I wanted to use my own grandmother’s face rather than that of the charmer in the first reference photo. 2. On the basis of these decisions, I set to work on the cover of January Jinx. I did a number of color tests to get the right color for Minty Wilcox’s garnet red suit. Here’s a sample of a color text. I laid out the cover to fit a 6″ by 9″ format so I wouldn’t need to do too much in Photoshop. I played with fonts, printed samples, and decided on Trajan Pro. The photo below shows an early version of my cover layout. Then I ran into trouble with the frame. I did the outside edges, but I couldn’t figure out how to do the inside points. 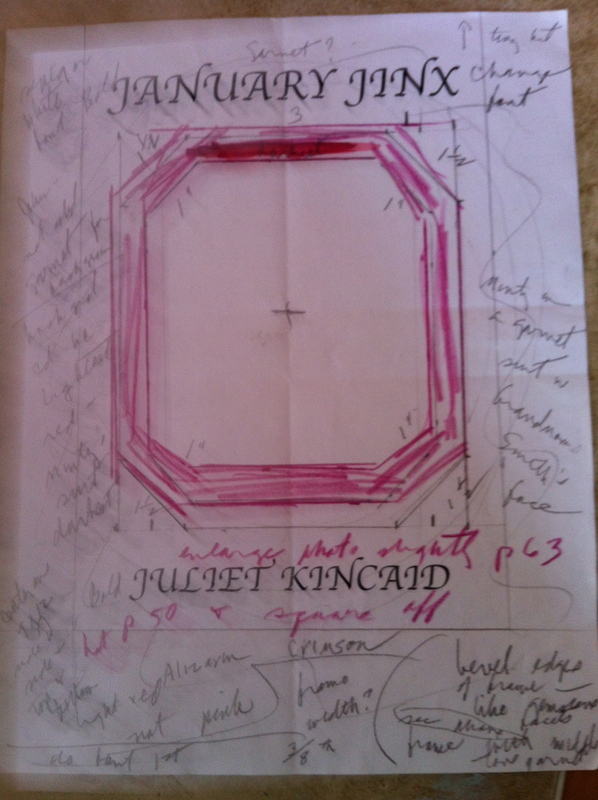 I asked for help from Barbara O’Leary, my art teacher, who said, “It’s just geometry, Juliet.” Waving my hands hysterically, I shouted, “Do you know how long it’s been since I had geometry?” Once Barbara showed me how, I quickly finished the frame. 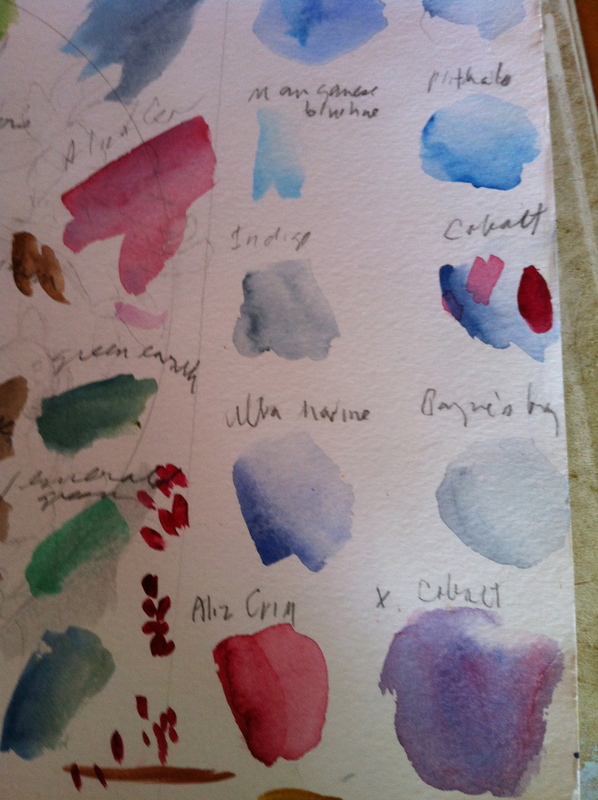 Next I transferred my reference photo to my watercolor paper. Now, my mode of doing this is crude. I make a photocopy, reducing or enlarging as I need to. Then I cut the image out and draw around it on my paper. Finally, I refine the image with pencil. Here’s where I ran into trouble, lots of it, on my model’s right hand, the chair, and the girl’s face. 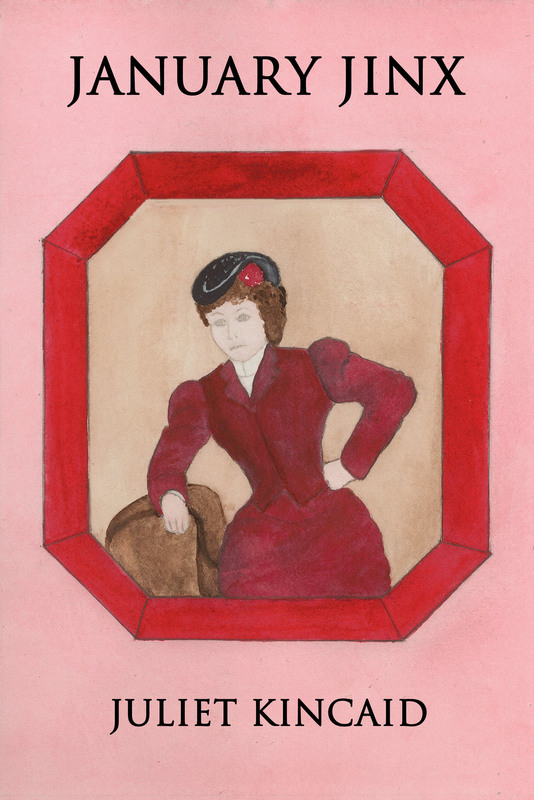 With such a small painting, her eyes were barely an eighth of an inch wide. So even the tiniest slip of the pencil tip made them cross. But the principle of simplifying held me in good stead with all three problems. Minty’s face ended up not looking much like my grandmother’s, though. The actual painting went along well except I accidentally got Alizarin Crimson a few places where I didn’t want it. Mostly I fixed those glitches with the brush, but one I left to fix in Photoshop. 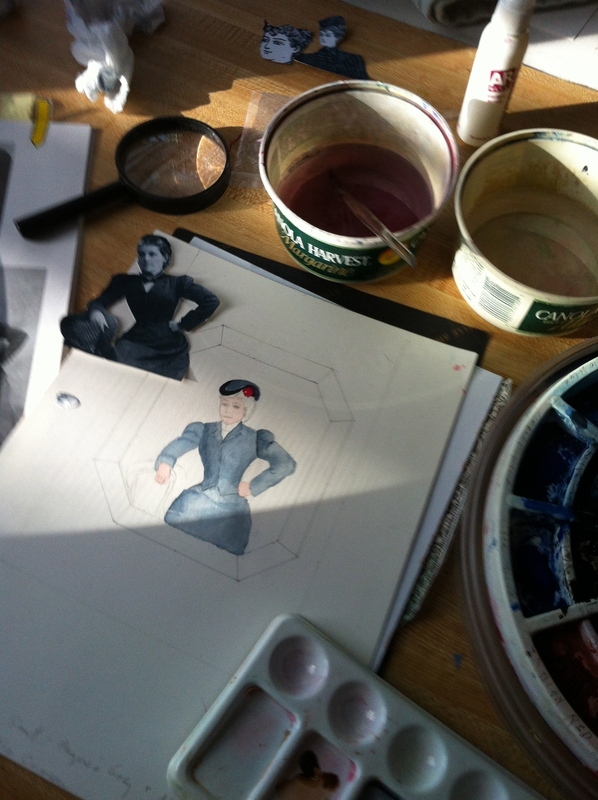 Here’s a photo of the cover in progress showing my pattern and the suit with a Payne’s Grey undercoat. 3. Using Photoshop I completed the cover. By the time I did the cover of January Jinx, I already knew how to crop a simple image, to insert text, to adjust image size, and save a cover as a jpg file. To these skills and with advice of three different people, I added correcting images to my Photoshop skills. And so I removed the extra bit of Alizarin Crimson from the top inside of the frame. Here’s the finished cover. As usual during the process of publishing my own work, I learned a lesson. Reducing an image to such a small size creates problems like the one I had with Minty’s eyes. So the next time I do a cover I plan on painting the image larger and reducing it in Photoshop. I have the skills for that, I think. By now you might be asking why I go to all this trouble doing my own covers to save some money. The answer’s simple. The covers of my books and stories may seem a little amateurish, but they look like no one else’s. They stand out among other books on Amazon sell pages and on bookstore shelves. January Jinx is now available as a Kindle eBook (www.amazon.com/dp/B00HSSSBE4) and the trade paperback is coming soon. You can buy also Cinderella, P. I. and Other Fairy Tale Mystery Stories as a Kindle eBook (www.amazon.com/dp/B00GMMUSTI) or trade paperback. Walls, a Cinderella, P. I. Novel is available as an eBook (www.amazon.com/dp/B00FQLQ2WI) and trade paperback.